Welcome to the world beneath Wayne Manor, where the heroes can be as dark as the villains they face. I decided to play a little with the familiar characters of DC Comics Batman line. I acknowledge that all Batman related characters are copyright of DC Comics, and are here for no other purpose but as fan art. 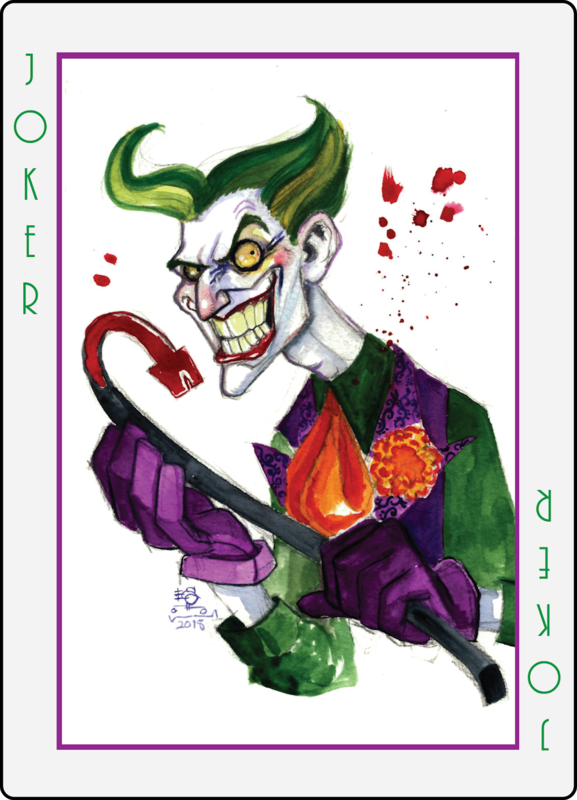 First up, the nefarious Clown Prince of Crime, the Joker. Although he's been portrayed in many different ways across multiple media, the characteristics that have stayed with me since childhood are the green hair, white skin, and bright red lips pulled into a gruesome smile. This watercolor version accentuates the fashion style of Jack Nicholson's portrayal, merged with the Bruce Timm animated character, voiced by Mark Hamill. My own style is influenced by the comic creators, as well as animation studios like Warner Bros. and Disney.